I used to call these "cut outs" when I was young. The idea is that you cut out the base image (in this case, Vampirella) and the costumes from the print, and then you could spend hours of endless fun changing tech attire of the base image by overlaying the costumes and holding them in place by folding the tags at the sides. As a collectable, any paper doll becomes instantly rare as soon as it is issued as you know that the majority of the prints will be cut up or thrown away by the great masses who don't realise what they have got in their hands! To get a copy of a paper doll still in pristine condition is therefore very difficult! 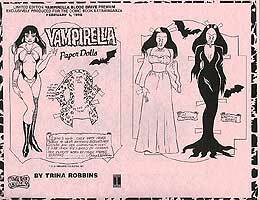 Produced for the Comic Book Extravaganza (NYC) VAMPIRELLA Blood Drive, this limited paper-doll print was given ONLY to those to donated blood on February 5, 1995 at the event. Extremely rare and highly sought after, this print features Vampirella in her "red costume", Leopard Print Coat, Lily Munster dress and Morticia (Addams Family) dress. The art is by Trina Robbins, which is quite appropriate as she designed the original Vampirella costume for Warren Publishing back in 1969! The print measures 8.5" X 11" on a pink paper. I saw this "dress up" doll on eBay many moons ago, and have no information about it other than the JPEG you see. Unfortunately, I can't read the writing on the JPEG which may have given more information, but the principle of the Dress Up doll is obvious. If you can enlighten me (and everyone else) about this item please get in touch.